Africa: The Trump Administration's Africa Strategy - Primacy or Partnership? Will Top Trump Africa Posts Finally Get Filled? Peter Pham - President Trump's Perfect Pick for Top Africa Post? What Direction for U.S. Africa Policy Under Trump? How Might Trump Change Africa Policy? Washington, DC — Last week, the Trump administration launched an Africa policy that seeks both primacy and partnership on the continent. The administration's efforts at partnership, especially as it relates to promoting U.S. business on the continent, are likely to be far more lasting and consequential. Ambassador John Bolton set the tone for the administration in a speech where he challenged African governments to choose the United States over China and Russia for their commercial, security, and political relationships. This throwback to great power rivalry runs counter to the most significant current trend in Africa's external relationships, which have more diversity than at any time since the end of the Cold War. This diversity is a key aspect of the economic growth that Africa has enjoyed over the last two decades. Shortly after Bolton's presentation, U.S. Agency for International Development (USAID) Administrator Ambassador Mark Green rolled out the development agency's first-ever" Private Sector Engagement Policy." At its center is Green's belief that the "future of international development is enterprise-driven." Going forward, USAID will seek to deepen its collaboration with U.S. firms across "all areas of [its] work," including energy, agriculture, humanitarian assistance, women's empowerment, education, and crisis and conflict. This reset for USAID will help to increase U.S. commercial engagement in Africa and reflects important developments on the continent. Last month, at the first Africa Investment Forum in Johannesburg, Dr. Akinwumi Adesina, President of the African Development Bank, said , "Africa is not going to be developed by aid. It will be developed by investment." Creating opportunities for the private sector to impact Africa's key development priorities is central to addressing some of the continent's most pressing challenges. The strategy announced by Ambassador Bolton on December 13 is organized around three main principles: prosperity, through "advancing U.S. trade and commercial ties with nations across the region to benefit both the United States and Africa;" security, through "countering the threat from radical Islamic terrorism and violent conflict;" and stability, through foreign aid, while ensuring that U.S. taxpayer dollars for aid are used efficiently. The focal point of the strategy is countering China's commercial, security, and political influence in Africa. The administration is right to criticize China where its practices contribute to growing the debt of African nations and worsening corruption and detrimental labor practices. By labeling China's commercial practices as "predatory" for the strategic use of debt to hold African states "captive," the administration clearly seeks to offer the U.S. as an alternative, mutually beneficial commercial partner to African nations. However, when it comes to trade and investment, the Trump Africa strategy does not reflect the preference by most African countries and the African Union for a regional approach through the newly created African Continental Free Trade Area, but favors instead a country-specific, bilateral approach. The administration should consider both approaches. Russia was specified as another country that is rapidly expanding its financial and political influence across Africa, although the reference appears to be more reflexive than anything else. While Russia's trade with Africa has increased 10-fold between 2000 and 2012, it still accounts for less than 1 percent of Africa's total trade. More problematic for U.S. commercial interests in Africa than Russia and perhaps even China are the economic partnership agreements that the European Union has struck with 41 African countries that put U.S. exports to the region at a significant disadvantage. As the U.S. Trade Representative's 2018 Trade Barriers report notes, the agreement between the EU and the Southern Africa Development Community "will further erode U.S. export competitiveness in South Africa and the region." This seems to have escaped the administration's attention. The Trump administration, which once wanted to cut development assistance by 30 percent, has now promised to use it "efficiently and effectively" to further U.S. interests in the region. There is no question that aid resources have been squandered in some areas. However, some U.S. aid programs have achieved extraordinary successes, such as the multi-billion dollar President's Emergency Plan for AIDS Relief (PEPFAR), which has provided more than 13.3 million HIV-infected men, women, and children with antiretroviral therapies globally, the majority of whom are in sub-Saharan Africa. Along these lines, in a White House fact sheet accompanying Bolton's address, the administration committed to "preventing, detecting, and responding to outbreaks of deadly infectious diseases." Given that the Trump administration asked Congress to rescind $252 million in Ebola funding earlier this year, prevented U.S. health experts from working on the frontlines of the current Ebola outbreak in the Democratic Republic of the Congo, and dismantled the global health security and biodefense directorate on the National Security Council, it remains to be seen how the administration will fulfill this commitment. When discussing peace and security, Ambassador Bolton stated that the U.S. would only support effective and efficient U.N. peacekeeping missions. The world agrees that the United Nations needs more accountable, robust, and effective peacekeeping missions that can decisively bring peace and ensure stability. But it is critical for the U.S. to be more specific about the actions it will take to address this issue and join efforts to reform and empower rather than weaken U.N. peacekeeping operations. The U.S.'s actions should be taken primarily against the belligerents who are causing conflicts and instability rather than the peacemakers and peacekeepers who are trying to end conflicts and bring stability. 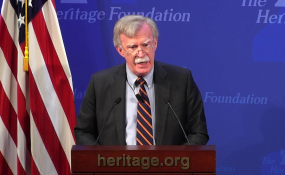 While Bolton focused on only the administration's Africa strategy, he also referenced a new initiative, "Prosper Africa," that presumably will be announced in the near future. This program is intended to support U.S. investment across the region, improve the business climate, and accelerate the growth of Africa's middle class. The program should be aggressively pursued if the U.S. is serious in its intention of providing an alternative to China or Russia in Africa while advancing U.S. and African interests. Inevitably, USAID's Private Sector Engagement Policy will be a central piece of the new initiative. With the passage of the Better Utilization of Investments Leading to Development Act in October—which will create the $60 billion U.S. Development Finance Corporation—the Trump administration may have established an agency with impact on par with the Millennium Challenge Corporation and initiatives such as PEPFAR, the African Growth and Opportunity Act, the Young Africa Leaders Initiative, and Power Africa. By emphasizing partnership over primacy, the Trump administration has the potential to establish a very positive legacy on the continent. Witney Schneidman is Nonresident Fellow - Global Economy and Development, Africa Growth Initiative. Landry Signé is David M. Rubenstein Fellow - Global Economy and Development, Africa Growth Initiative. Read the original article on Brookings. Copyright © 2018 The Brookings Institution. All rights reserved. Distributed by AllAfrica Global Media (allAfrica.com). To contact the copyright holder directly for corrections — or for permission to republish or make other authorized use of this material, click here. Africa: Defining the Trump Africa Strategy - Primacy or Partnership? Africa: The 2018 AGOA Forum: A Turning Point for US-Africa Commercial Relations?